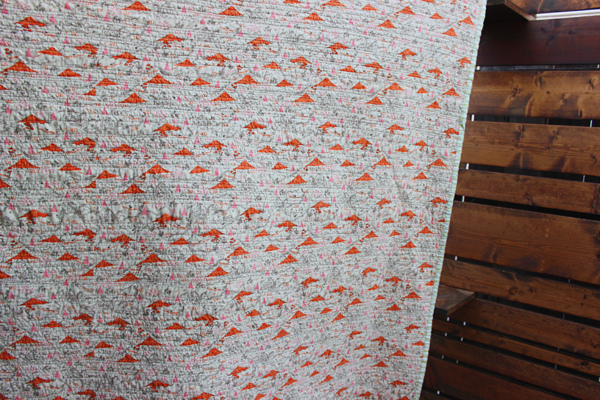 It's pretty lame that it has taken me so long to make another quilt. 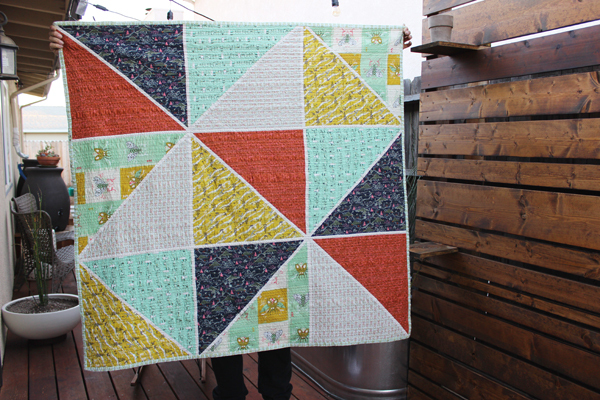 In January 2015 I made a big quilt in a month and it took me months and months to make this little one despite the fact that I really really enjoy the quilting process. Ohhhhhh well. 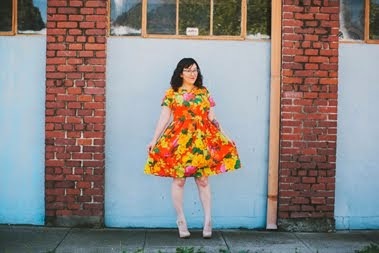 I purchased "Sew a Modern Home: Quilts and More for Every Room" immediately after finishing my last quilt, but didn't break out the book until the middle of 2016. I had been hoarding some Tokyo Train Ride fabric by Cotton and Steel and decided to use it to make myself this little lap quilt. Whenever I start a project I always dedicate a day to cutting/hunching over my cutting mat with my rotary cutter and making my back ache. There aren't very many pieces in this quilt, however, it took me a while to figure out how I wanted the colors to lay next to one another. A lot of the fabrics are directional prints, so it was impossible to get the fabric prints to all line up AND have the colors arranged the way I liked. In the end I decided to focus on the color placement and forget about the print direction. The actual sewing of the quilt top was quick, I finished it in a day. And by the end of that day I became very close friends with my iron 😐 There were a lot of seams that needed to be pressed open! It was not a tricky top to sew though, so if you are a beginner who is interested in quilting I would definitely give this one a go. 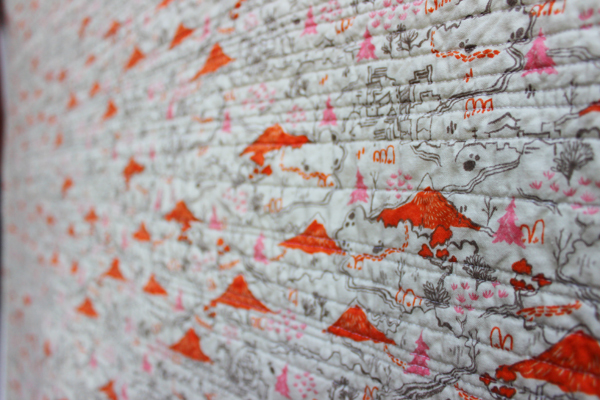 My absolute favorite part of this project is how I did the quilting. I just did straight lines randomly spaced apart at different distances. I use a Pfaff and it has a built in walking foot, but other than that I didn't need any "fancy" quilting tools. I have a presser foot for garment sewing that I use for stitching in the ditch/edge stitching and by using that foot in combination with moving my needle to the right at different distances I was able to achieve a random line combination. Occasionally I would get out my clear ruler and draw a straight line of chalk one or one and a half inches from the line I just sewed and stitch over it. Definitely time consuming, but the end effect is very pleasing, at least I think so! 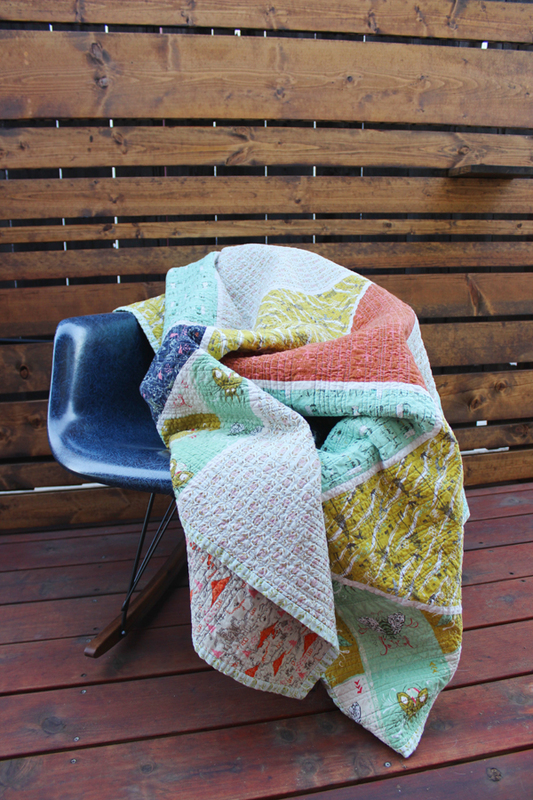 I love my quilt and solemnly swear to make more in the future. Beautiful! I want to learn to quilt this year, this is inspirational! This is so gorgeous Erin!! I think the colour combination/order you've gone for works perfectly. It's always hard to work out how to lay the pieces out isn't it?! 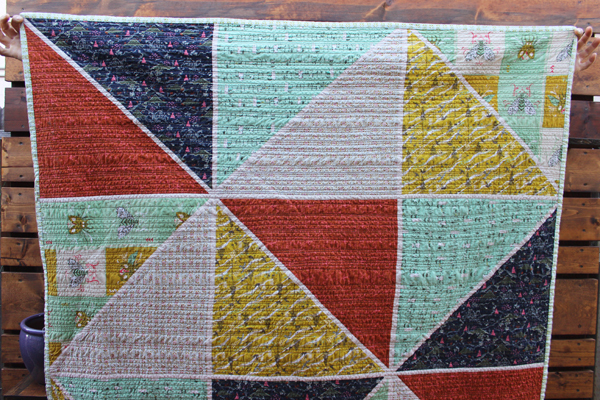 I love the irregular straight line quilting you've done, I'll need to try that!